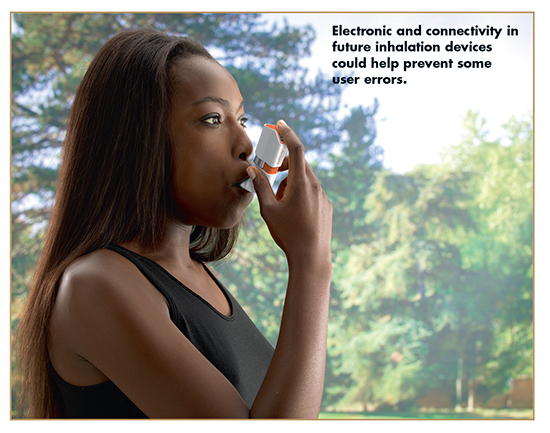 The addition of electronic and connectivity to inhalers may improve patient adherence and, consequently, treatment efficacy. This conclusion was unanimously reached by a panel of experts participating in a recent roundtable discussion hosted by Nemera, a France-based designer, developer, and manufacturer of drug delivery devices. -Pressurized metered-dose inhalers (pMDIs) consist of an aluminum canister of medication fitted into a plastic body with a mouthpiece. Each dose is delivered by pressing the canister into the plastic body while inhaling through the mouthpiece. Use of a spacer that connects to the MDI removes the need for coordination between inhalation and activation of the device; formulation is first released into the spacer and then inhaled slowly. -Dry-powder inhalers (DPIs) can be preloaded with the medication(s) inside the device or be loaded by the patient with capsules as the dose-holding system prior to use. A single dose of the medication is loaded and ready to be inhaled, for example, by sliding a lever, twisting a part of the device or, in the case of capsule devices, pressing buttons to pierce the capsule. Patients simply take a deep breath while their lips are sealed around the mouthpiece of the inhaler, and the dose is delivered. -Soft mist inhalers are a propellant-free liquid inhaler that provides a slow-moving, soft aerosol cloud of medicine to help patients inhale. In comparison with a pMDI, they reduce mouth deposition and generate a “mist of droplets” lasting longer than the Pmdi aerosol. -Nebulizers change medication from a liquid to a cloud of medicine that can last up to 15 minutes. They are used to deliver large doses of drug. -Dose preparation errors – In the case of an MDI, the patient may not shake the canister before each dose or may exhale while actuating the device. In the case of a DPI, the patient may fail to load a dose at all. Or, if a DPI requires piercing a capsule, the patient may not pierce the capsule and may not use a new capsule for each dose. -Improperly using the device – For example, the patient may fail to remove the cap of the inhaler. -Improperly holding the device – In some cases, it is not uncommon for the patient to hold the device sideways or at an incorrect angle. If the dose, to be properly loaded or delivered, needs the device to be held in a certain position, it may be incompletely delivered or not delivered at all. -Inhalation errors – Issues include breath coordination and depth of breath. Patient fails to: exhale fully and away prior to inhalation; inhale slowly and deeply; or hold their breath for a full 5 to 10 seconds. -Connected devices to enable richer feedback to patients or communication with doctors. A connected device, such as an inhaler, is connected to a smartphone app or a website to communicate with the patient. This may include sending reminders to take medication and providing usage feedback. This information can also be sent to the patient’s doctor to monitor patient adherence and treatment efficacy. Ms. Audibert says the doctor can then determine, in the case of unsuccessful treatment, if it is due to an absence of patient response to a specific drug, if the treatment was not taken as prescribed, or if the patient exhibited poor inhalation techniques, at which point corrective action can be taken. Electronic drug delivery systems are categorized as either add-ons or integrated devices. Both options have distinct advantages and disadvantages, with both being widespread in development projects throughout the pulmonary spaces. Sensors mechanical devices and providing tracking and usage information. Integrated devices go one step further by enabling, for example, electronic-driven actuation of the device that can be then coordinated with a breath. Adding electronic connectivity requires a printed circuit board (PCB) containing a micro controller and sensors, such as an accelerometer or microcontroller. The integrated device connects to a mobile application or to the cloud via the use of wireless communication elements such as Bluetooth or LTE-M.
Connectivity is possible with all types of inhalation devices. A few players are already demonstrating their technical capabilities to build such devices. For example, Nemera’s knowledge in development, manufacturing, and innovation has resulted in a few concept devices that showcase how electronic features are transferrable across multiple platforms, such as inhalers. One of these concept devices is the e-Novelia®, a smart add-on device for the established Novelia eyedropper. Electronic features include: tilt sensor and LED indication for device positioning; location tracking; remaining drug indicator; electronic instructions for use (IFU); drop detection; and Bluetooth communication. According to Mr. Gremillet, e-Novelia uses sensors to detect, for example, when the incline of the device is correct, and signals this to the patient via a green light. Digital readouts provide feedback about dosing and remaining medication. And communication with a smartphone app enables medication reminders, and ultimately, patient adherence. The second concept device from Nemera is e-Advancia®, a reusable, rechargeable add-on device for an established product. Combined with the Advancia® high-performance pump, the add-on features shaking sensors, a display, reminders, dose counter, posology indication, and a connected app. “For pharmaceutical companies interested in electronic-enhanced devices, we can integrate all our know-how about electronic/connectivity into a specific inhalation project as part of the features obtained are also of interest for inhalation,” he says. In a world where hacking exists, users should take steps to secure the connection from the device to the smartphone, from the device to the cloud, the smartphone app, and the cloud itself. Mr. Gremillet says that Nemera has internal experts to provide guidance and support to protect data generated by using electronic devices, which includes specific cloud architectures among other things. Connected Drug Delivery Devices Market Worth $717.7 Million By 2025, Grand View Research, December 2018, https://www.grandviewresearch.com/press-release/global-connected-drugdelivery-devices-market. Correct Use of Inhalers: Help Patients Breathe Easier, Institute for Safe Medication Practices, July 14, 2016, https://www.ismp.org/resources/correct-use-inhalers-help-patients-breathe-easier. 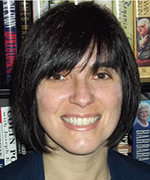 Cindy H. Dubin is an award-winning journalist who has been reporting on the pharmaceutical industry for more than 18 years about a variety of topics, including formulation development, drug delivery, and drug quality.